At the time of arrival of the Alsthom/Sulzer locomotives the railways of Ecuador were thin on the ground, two lines connected Quito with the coast, a south westerly route to Guayaquil and one northwards to San Lorenzo. Both routes were fraught with severe grades, the Guayaquil line featured a 49 mile climb averaging 1 in 26, the steepest grade being at 1 in 18, the summit of this line reached 11,820 feet. The San Lorenzo line had 95 miles averaging 1 in 52, the steepest grade being 1 in 29, with the summit on this line reaching 10,200 feet. On the Guayaquil line 1929 built Beyer-Garratts hauled 150 ton trailing loads, enquiries concerning diesel locomotives had been pursued for a number of years, but to improve on the existing steam power the new diesels would require a minimum of 1,500hp, with pressure charging due to the high altitude over much of the routes. The Quito - San Lorenzo line had only been made a through route during the mid 1950's, aided by French interests & finance, it was this connection that led to Alsthom producing a triple bogie design to meet the conditions in Ecuador. To power the new locomotives the proven Sulzer 6LDA25 power units were fitted. These were normally rated at 760hp at 800rpm, but due to the conditions in Ecuador the rating was decreased to 610hp at 800rpm, principally to accomodate the high altitude and high temperatures. Dry engine weight was 15,000lb, which included the substantial welded steel underbed. The underbed has elastic supports to the locomotive frame. Cylinder size was 250mm by 320mm. Engine speed was controlled pneumatically through a servo motor, providing ten speed notches. Water & oil cooling is done through two side mounted radiators, electrically powered roof fans draw in and expel the air. The fans were in fact on a direct extension of the armature shaft. Their speed varied in accordance with the engine speed & so approxiamately in accordance with the engine output. 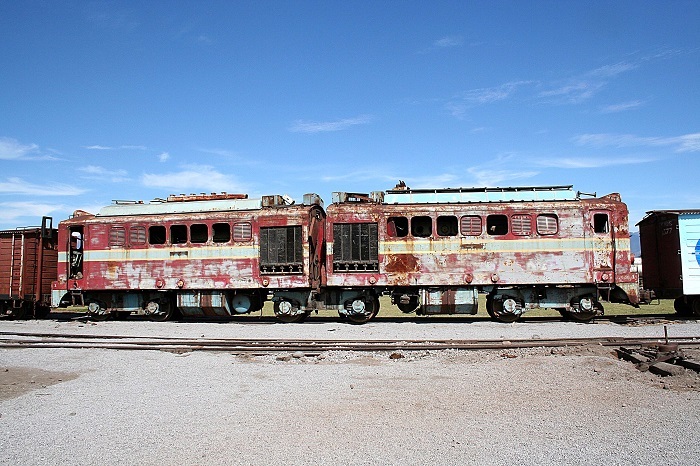 To meet the Ecuadorian requirements Alsthom designed a three bogied locomotive comprised of two symmetrical bodies and underframes, with a driving cab at each outer end, an engine/generator set with all necessary auxiliaries in each half unit, the center bogie being used to articulate the set. The side panel plates were stressed in order to assist the side framing in carrying its load. The roof was of aluminium, removable in sections to allow access to the main components. Driving cabs were insulated, from heat, cold & engine room noise, electric footheaters were provided. Two underframe fuel tanks were fitted, each holding 400 gallons, sufficient to make a round trip between Quito & San Lorenzo. All bogies were essentially the same, of the Alsthom type featuring a conical rubber pivot and four lateral side bearers of rubber to equalise the load. This arrangement permitted pivoting without wear, any movement being taken up as deformation in the rubber. It also provided the secondary bogie suspension, whilst also transmitting longitudinal inertia forces and shocks. Axleboxes were of the pressure lubricated, plain bearing Athermos type but without normal guides and with Slientbloc connections to the bogie frames. 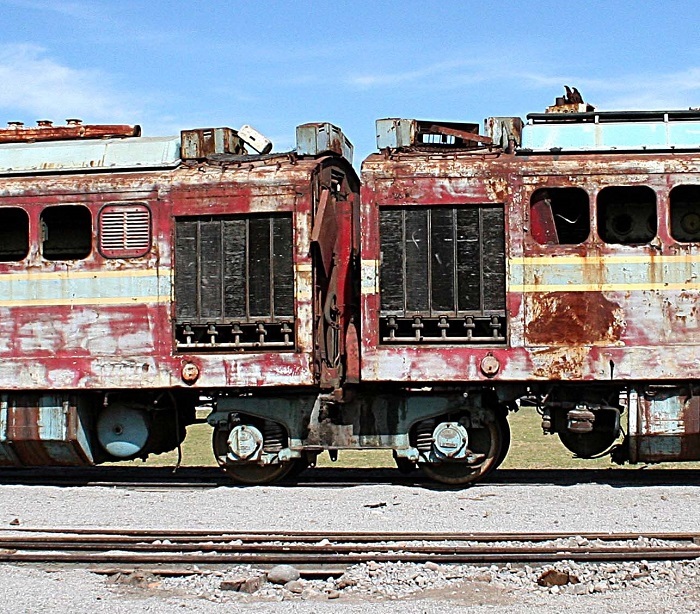 The centre bogie differed in having a double cone, one for each body half. The bogie frames are of welded box section with a strong central cross box section, there are no end headstocks. All six axles are powered by 170hp nose suspened traction motors. A self ventilated main generator with seperate excitation, shunt and anti-compound windings, nominally rated at 620 kW at 800rpm, a one hour rating of 1,410amp 355volts, a continuous rating of 1,350amp 370volts, with a maximum current of 2,000amp. The auxiliary generator, which assures the excitation of the main machine feeds the auxiliaries & charges the batteries. It is of the saturated type with separate excitation, its voltage is in linear proportion to the rotational speed. Output at 800rpm was 65kW, voltage 380, current 170amps. The six force ventilated 170hp traction motors drive the 37.5in disc wheels through 14:79 gears, each motor has a one hour rating of 235amp 710volts, the continuous rating is 225amp 740volts. Each traction motor has its own motor blower set which is carried on the outside of the bogie frame. Each half locomotive has a cabinet containing the electrical control gear. Starting, excitation and auxiliary-equipment contactors are electro-magnetic, those for the reversers, rheostatic braking and traction are electro-pneumatic. The control allows either or both engine-generator sets to be run or stopped, or controlled from either cab. With only engine running the six traction motors are still fed all in parallel from the working generator, the same tractive effort is obtained but the speed is halved. The six traction motor blower sets and the battery charging is fed from the working auxiliary generator. The battery is divided between each half, being a 96 cell alkaline unit of 244 amp/hr capacity. To haul 325 ton trains up 1 in 29 grades and maintain a maximum speed of 43.5mph on the level sections it was found necessary to couple the main generators in series and the six traction motors coupled permanently in parallel. To attain top speed the motor fields are shunted in one step by 50% above a speed of 18.5mph. The shunt is a manual operation by the driver, however the return to full field is done automatically. Power is regulated automatically from the engine regulator which actuates a rheostat to diminish or increase the excitation of the main generator and so maintain at all times the balance of generator and engine outputs, and maintain the engine speed constant in the apprpriate notch. Straight and automatic air brakes for locomotive and train were fitted. An electrically driven Westinghouse-Chabay compressor was housed in each half body. Each bogie carried a brake cylinder which applied pressure to one brake block on each wheel. The fitting of a rheostatic brake for use on the longer steeper grades allowed for this one brake block per wheel. Interlocking controls ensured that when the rheostatic braking was in operation the straight airbrake could be applied on the locomotive, though the train brakes remained operational, avoiding potential wheel skids. This was the first use of dynamic braking by Alsthom on a diesel electric locomotive. Sanding was electro-pneumatic through two sets of six sandboxes, with sand applied to six wheels at the same time. In rheostatic braking the motors acted as generators, separately excited, coupled in parallel, the generated current was fed into roof mounted resistance grids. The radiator fans provided air to cool these grids. Current could also be diverted to power the fan motors and charge the battery. Should the current generated by the rheostatic braking exceed the operating limits the automatic air brake would be applied, increasing the rate of braking and reducing the load on the motors, therefore correcting the overload situation. This action would also occur automatically if the rheostatic braking suffered a failure when no other braking was applied. Photograph courtesy Kevin Staddon A visit to Ibarra, Ecuador during September 2005 found several of the locomotives still in existance, including the one shown in the view above. The lower view shows a closeup of the center bogie. Based on an article in Diesel Railway Traction, March 1958. Last updated August 12th 2015.